Book Description As the Harry Potter sequence draws to a close, Harry's most dangerous adventure yet is just beginning . . . and it starts July 16, 2005. We could tell you, but then we'd have to Obliviate your memory. Editorial Reviews Amazon.com Review The long-awaited, eagerly anticipated, arguably over-hyped Harry Potter and the Half-Blood Prince has arrived, and the question on the minds of kids, adults, fans, and skeptics alike is, "Is it worth the hype?" The answer, luckily, is simple: yep. A magnificent spectacle more than worth the price of admission, Harry Potter and the Half-Blood Prince will blow you away. However, given that so much has gone into protecting the secrets of the book (including armored trucks and injunctions), don't expect any spoilers in this review. It's much more fun not knowing what's coming--and in the case of Rowling's delicious sixth book, you don't want to know. Just sit tight, despite the earth-shattering revelations that will have your head in your hands as you hope the words will rearrange themselves into a different story. But take one warning to heart: do not open Harry Potter and the Half-Blood Prince until you have first found a secluded spot, safe from curious eyes, where you can tuck in for a good long read. Because once you start, you won't stop until you reach the very last page. 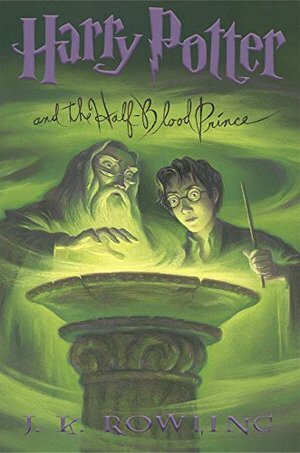 A darker book than any in the series thus far with a level of sophistication belying its genre, Harry Potter and the Half-Blood Prince moves the series into murkier waters and marks the arrival of Rowling onto the adult literary scene. While she has long been praised for her cleverness and wit, the strength of Book 6 lies in her subtle development of key characters, as well as her carefully nuanced depiction of a community at war. In Harry Potter and the Half-Blood Prince, no one and nothing is safe, including preconceived notions of good and evil and of right and wrong. With each book in her increasingly remarkable series, fans have nervously watched J.K. Rowling raise the stakes; gone are the simple delights of butterbeer and enchanted candy, and days when the worst ailment could be cured by a bite of chocolate. A series that began as a colorful lark full of magic and discovery has become a dark and deadly war zone. But this should not come as a shock to loyal readers. Rowling readied fans with Harry Potter and the Goblet of Fire and Harry Potter and the Order of the Phoenix by killing off popular characters and engaging the young students in battle. Still, there is an unexpected bleakness from the start of Book 6 that casts a mean shadow over Quidditch games, silly flirtations, and mountains of homework. Ready or not, the tremendous ending of Harry Potter and the Half-Blood Prince will leave stunned fans wondering what great and terrible events await in Book 7 if this sinister darkness is meant to light the way. --Daphne Durham Visit the Harry Potter Store Our Harry Potter Store features all things Harry, including books (box sets and collector's editions), audio CDs and cassettes, DVDs, soundtracks, games, and more. Begin at the Beginning Why We Love Harry Favorite Moments from the Series There are plenty of reasons to love Rowling's wildly popular series--no doubt you have several dozen of your own. Our list features favorite moments, characters, and artifacts from the first five books. Keep in mind that this list is by no means exhaustive (what we love about Harry could fill ten books!) and does not include any of the spectacular revelatory moments that would spoil the books for those (few) who have not read them. Enjoy. Harry Potter and the Sorcerer's Stone Harry Potter and the Chamber of Secrets Harry Potter and the Prisoner of Azkaban Harry Potter and the Goblet of Fire Harry Potter and the Order of the Phoenix Magic, Mystery, and Mayhem: A Conversation with J.K. Rowling "I am an extraordinarily lucky person, doing what I love best in the world. Im sure that I will always be a writer. It was wonderful enough just to be published. The greatest reward is the enthusiasm of the readers." --J.K. Rowling Find out more about Harry's creator in our exclusive interview with J.K. Rowling. Did You Know? A Few Words from Mary GrandPré "When I illustrate a cover or a book, I draw upon what the author tells me; that's how I see my responsibility as an illustrator. J.K. Rowling is very descriptive in her writing--she gives an illustrator a lot to work with. Each story is packed full of rich visual descriptions of the atmosphere, the mood, the setting, and all the different creatures and people. She makes it easy for me. The images just develop as I sketch and retrace until it feels right and matches her vision." Check out more Harry Potter art from illustrator Mary GrandPré. From School Library Journal Grade 5 Up-Opening just a few weeks after the previous book left off, the penultimate entry in the series is, as the author foretold, the darkest and most unsettling yet. The deeds of Voldemort's Death Eaters are spreading even to the Muggle world, which is enshrouded in a mist caused by Dementors draining hope and happiness. Harry, turning 16, leaves for Hogwarts with the promise of private lessons with Dumbledore. No longer a fearful boy living under the stairs, he is clearly a leader and increasingly isolated as rumors spread that he is the Chosen One, the only individual capable of defeating Voldemort. Two attempts on students' lives, Harry's conviction that Draco Malfoy has become a Death Eater, and Snape's usual slimy behavior add to the increasing tension. Yet through it all, Harry and his friends are typical teens, sharing homework and messy rooms, rushing to classes and sports practices, and flirting. Ron and Hermione realize their attraction, as do Harry and Ginny. Dozens of plot strands are pulled together as the author positions Harry for the final book. Much information is cleverly conveyed through Dumbledore's use of a Pensieve, a device that allows bottled memories to be shared by Harry and his beloved professor as they apparate to various locations that help explain Voldemort's past. The ending is heart wrenching. Once again, Rowling capably blends literature, mythology, folklore, and religion into a delectable stew. This sixth book may be darker and more difficult, but Potter fans will devour it and begin the long and bittersweet wait for the final installment.-Connie Tyrrell Burns, Mahoney Middle School, South Portland, ME Copyright ® Reed Business Information, a division of Reed Elsevier Inc. All rights reserved.